Bhanubhakta Acharya (Nepali: भानुभक्त आचार्य; 1814 – 1868) was a Nepalese poet and writer who translated the great epic Ramayana from Sanskrit to Nepali language. Born in 1814 in Chundi Ramgha, Tanahun District, he was educated at home with a strong leaning towards religion from his grandfather. 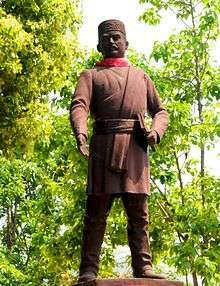 He is honoured with the title Adikavi (First poet) of Nepal. The first Nepali poet who also translated the great epic ‘Ramayana’ from Sanskrit to Nepali, Bhanubhakta Acharya was born on 29 Ashar, 1814 in Tanahu district of Nepal. Acharya was born to a Brahmin family and received excellent education with a strong leaning towards religion from his grandfather at home. He is honored with the title Adikabi for the contributions he has made in the field of poetry and Nepali literature and every year, his birthday is celebrated as a festival of Bhanujayanti (13 July) by conducting various programs, usually academics and poem recitation. Motiram Bhatta, first referred to him as Adikabi while writing Acharya’s biography in 1981. He clarifies that Acharya is not called Adikabi because he was the first poet in Nepal but he deserved the title as he was the first poet who wrote with an understanding of the marma (inner essence) of the poetry. The Khas language which evolved into present day Nepali was considered bastardized and was limited to speech after the fall of the Khas Empire in the 15th century. Then, most of the written texts of South Asia were dominated by Sanskrit and it had strong influence in Nepal. As the Brahmins were the teachers, scholars and priests of the society because of their caste, their education was based on Sanskrit. Many poets had written poems that was Sanskritized while Acharya started to write in Khas language which not only popularized the language but also gained him acceptance from wide range of people. Acharya was highly impressed by Ram’s heroic exploitsand he wanted the deity to be more accessible to the people who spoke Khas andsince, most of the people did not understand Sanskrit language, he translated the epic into Khas language. The translation was so lyrical that rather than sounding like a poem it sounded more like a song. He did not study western literature so all his ideas and experiences were derived from his native land which made his writings more Nepali flavored. The key features of his writings were simple yet strong with a sense of religion, sense of simplicity and the warmth of his country that not many of other poets had been able to be compare to. Belonging to a wealthy family, he never had any financial trouble and had an unremarkable life until he met a grass cutter who wanted to give something to the society so he could be remembered after death too. The grass cutters words were what inspired him to do something leave a mark in the society. He wrote two masterpieces in his life among which, one is the Bhanubhaktey Ramayan and the other is a letter he wrote in verse form to the Prime Minister while he was in prison. He was made a scapegoat and sent to prison due to some misunderstanding in signing the papers. In prison, his health became bad and he was given false hopes of being set free but his case was not even heard. So, he wrote a petition to the Prime Minister requesting his freedom, which later became his one of his great works. He not only won his freedom with his poem but was also given a bag of money. When he died in 1868, he did not know he would one day be one of the most revered poets of Nepal. It’s just him and Laxmi Prasad Devkota who are known as the literary gods in the country. The only difference between them is that the works of Devkota are celebrated as much as the poet is while Acharya’s fame overshadows his writings. His creation, however, was not published and he died without receiving credit for his contribution. His works were published by Moti Ram Bhatta in 1887 after he found the manuscript and took it to Benaras, Indiafor printing. One of the Acharya’s works is well known for its colorful, flowing praise of Kathmandu valley and its inhabitants. Although he is one of the most celebrated and revered poets of Nepal, his works are not as famous as other poets in the history of Nepali literature. One of the most revered poets of Nepal, Bhanubhakta Acharya was the first poet to start writing in Khas language which later evolved as the present day Nepali language. Bhanu Jayanti is an annually celebrated cultural festival, prevalent among the Nepalese around the world in the remembrance of Bhanubhakta Acharya birthday anniversary. It is generally celebrated in the 13th of July in the 29th day of the Nepali month of Ashadh. Every year Bhanu Jayanti is celebrated as a mega event with literary seminars, and programs and amid a remarkable presence of Nepalese writer, novelist and others.On July 13 is celebrated as a symbol of nationality by Nepalese who are in and outside the country. Ācārya, Naranātha; Śivarāja Ācārya; Sāmbkslo thiyoarāja Ācārya & Jayaraj Acharya (1979). Ādikavi Bhānubhakta Ācāryako saccā jı̄vanacarittra. Tanuṅa: Naranātha Ācārya. OCLC 10023122. Wikimedia Commons has media related to Bhanubhakta Acharya.